A facilitator, team supervisor or trainer supports organizations and teams to find and understand their common objectives, to reflect and discuss their past performance and to improve future collaboration and communication. Supervision or trainings enable teams to improve their procedures and to find the best suitable ways to handle work, customer relations, conflicts, and challenges. The goal of this process is to mutually build a strong basis for future work performance and collaboration. Isabell Luetkehaus offers workshops, seminars and training on topics including communications, change management, negotiation, conflict management and work-life balance. A coach supports his client (coachee) to self reflect, revise and improve his working, co-operational and communication skills. Framed by a coaching plan, coach and coachee first set specific goals and objectives for the coaching process and the future development. Throughout the coaching, the confidential and personal relation between the coach and coachee allows to focus on individual needs and accomplishments, close observation, personal encouragement, impartial and non-judgmental feedback and guidance. Coaching commonly addresses attitudes, behaviors, and knowledge. The goal is to improve performance, develop and learn new skills, find success in personal and business relationships, achieve goals and better manage work-related and personal conflicts, challenges and changes. Isabell Luetkehaus is a Berlin-based, experienced mediator, facilitator, trainer and coach for business and personal matters. In the business context, she works with executives, employees, and teams. She also supports couples and families in personal matters. Isabell enjoys working with an international, mainly English-speaking clientele. After having completed her degree and PhD in German law, Isabell co-founded the British consultancy and investment boutique Portelet, and for many years worked in London, Singapore, Shanghai, Mumbai, and Zurich. Her main focus was to consult European companies in cross-border investments in Asia. She managed the office of Portelet in Zurich for three years, and worked as a technology scout for family desks which financed startup and other venture capital endevors. In addition to business development, she was in charge of HR and marketing at Portelet. 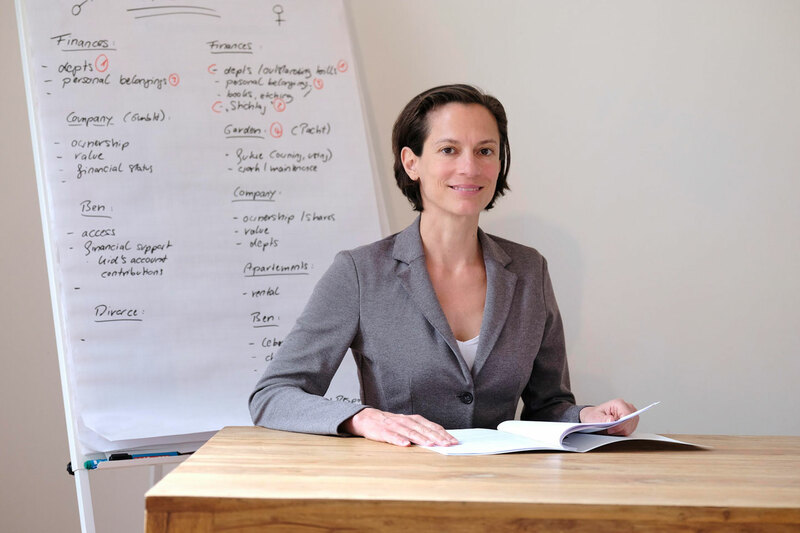 In 2004, Isabell moved to Berlin and founded “KonsensKanzei Berlin”, an agency specialized in mediation, facilitating, trainings and coaching, for international, English-speaking clients. As a communications specialist, she helps her clients to increase their self-awareness and better understand each other; she encourages them to see new possibilities, helps structure procedures and conflicts, supports them in valuating their options, finding own ways of handling the situation, and seeing the best suitable solutions. She is a believer in everybody’s ability to grow, overcome challenges, discover new options, and make self-responsible decisions.